Home » Blog » Which Rooms In Your Home Need New Windows? Taking windows seriously begins with a look around your home. Where do you appear to be missing natural light? Which rooms seem like they could appear larger? These are the kinds of considerations you and your family may take up when you begin thinking about new windows. If you or someone you know is looking for replacement windows in or near Gilbert, AZ, rest assured that there are a range of options that may meet your home’s needs. Those options include windows made of wood, vinyl, fiberglass, aluminum and wood that has been clad in vinyl or aluminum. Note that there are also a range of styles that you may choose from, assuring you every opportunity to keep your home updated and aesthetically appealing. You may even wish to speak with a designer in order to have some help while you consider various solutions. In the meantime, it is certainly worth surveying your home and determining where you need windows the most. Some rooms aren’t going to be the highest priority. Bathrooms and guest bedrooms may not seem particularly important to you. And installing windows in some basement rooms may not always be particularly easy. But other rooms are a different story. 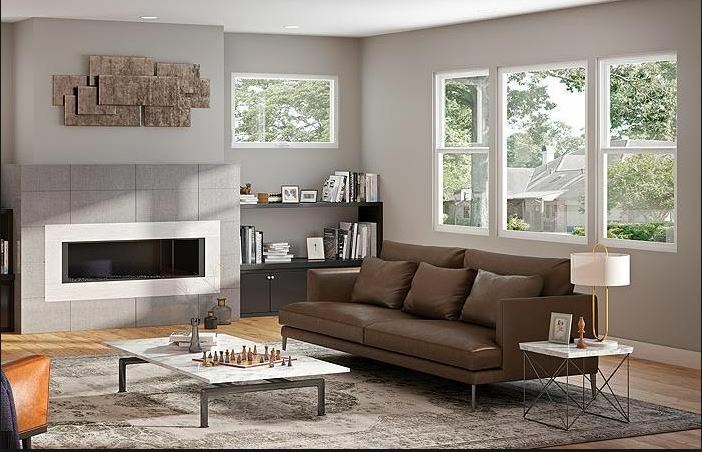 Family or living rooms may feel larger and more inviting when they include large windows. You may be more likely to use the room more often, and you certainly may be more interested in entertaining guests there. Natural light flooding one of these rooms can really change how they look and feel. And if your family or living room enjoys a nice view of the outdoors, you may wish to take greater advantage of that view. Who needs expensive artwork or accent walls when you can rely on a beautiful yard or sights there beyond? New windows may be a cost-effective way to enhance your primary living areas and change the way your home functions in important ways. Kitchens are also a great opportunity to use windows uniquely. While it may be difficult to create a wall of huge windows due to storage requirements, a window above the kitchen sink can certainly make doing the dishes more enjoyable. You can also install carefully shaped custom windows above your countertops and below cabinets, assuring that plenty of natural light enters the kitchen throughout the day. Windows can transform your kitchen and make it an all the more effective heart of your home. Of course, master suites can benefit from new windows, as well. Sometimes we don’t take advantage of those master bedrooms as much as we otherwise might. Windows can make them more welcoming rooms and change the view you wake up to. Where could you use new windows the most? Your home should tell you everything you need to know. If you are interested in replacement windows in the Gilbert, AZ, area, consider reaching out to Cougar Windows & Doors. We take a great deal of pride in addressing your home’s needs in an efficient and professional fashion. We look forward to working with you and your family. You can visit us at 3820 E Main St Ste 5, Mesa, AZ 85205 or place a phone call to (480) 699-9066.